As teenagers, my friends and I spent Friday nights driving backroads, throwing soda cans at street signs. The wind would be cold, the music would be loud, and sometimes, a can would bounce back and hit the car. But the noise of a Coca-Cola can on a yield sign was, well, something. There wasn’t much else to do. In small towns, you play sports or create your own games. We did both. Years later, when I coached in San Francisco, I didn’t understand why girls weren’t as obsessed with sports as I had been as a been. But I didn’t have the beach or museums or diversity of a city. I had backroads. I had street signs. I had basketball. B.F. Skinner called it an operant conditioning chamber. Inside, rats will administer drugs to the point of starvation: heroin, morphine, amphetamine, cocaine. Picture their paws scurrying back to the lever for another hit, like they’re going through a lay-up line. Picture the box—its walls white and blank. 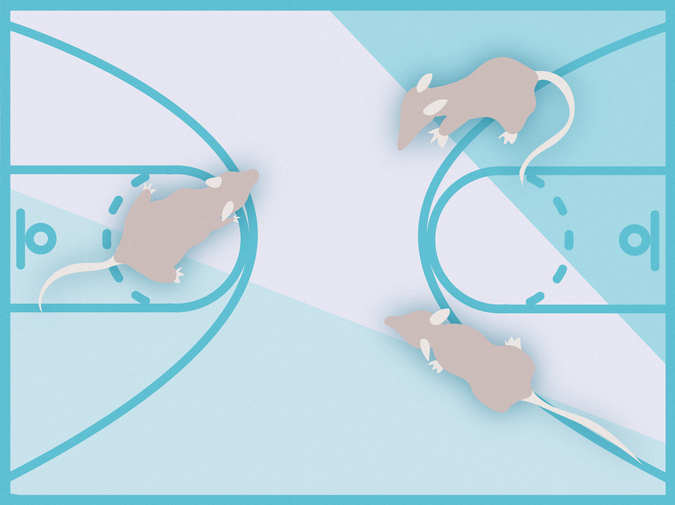 Scientists have shown that when rats have other rats and things to do, moderation is easier. What happens in a small town, a real-life Skinner Box, when you outgrow sports and shenanigans? I wonder this every time one of my high school classmates overdoses. Addiction runs in my family, which doesn’t feel foreign to me. I think I understand and fear compulsion and craving enough to have known what to avoid. But I still scurried to a lever in a Skinner Box. With basketball, both my anxiety and my hunger was ritualized. In sports, there is language for wanting; it’s what champions are made of. Compulsion becomes dedication, which becomes praise and playing time. Some desire is stigmatized. Some is worshipped. As teenagers, my friends and I re-enacted Sisterhood of the Traveling Pants for a school project, and I was Bridget. Single-minded to the point of recklessness, she says in the movie. What’s the difference really? People take drugs for the same reason people chase championships, money, promotions, other people. Because they want things to be different. Because they want more.